The prospect of the Big Match draws in a street urchin with a wonderful talent for kicking a tin can, a maker of jolly good pies, a dim but beautiful young woman, who might just turn out to be the greatest fashion model there has ever been, and the mysterious Mr Nutt (and no one knows anything much about Mr Nutt, not even Mr Nutt, which worries him, too. As the match approaches, four lives are entangled and changed for ever. Terry Pratchett brings to life another lineup of spectacular characters who inhabit a fascinating story. Well worth the read! A typically Pratchett perspective on something blends the mundane (watching foot-the-ball is not for me) into something mythical. Stephen Briggs' narration is, as always, spot on. This book was so good I kept listening to it again and again. Wow, what an amazing adventure. What a genius Terry Pratcket is. I feel as though I was living in the words he created. It was so wonderful and funny and exactly what you need on a long journey! Thoroughly satisfying story and very well read! Pratchetts latest book fails to the reach truly dizzying heights he has been capable of. perhaps even surpasses - the written work. Have you read "Asterix and the Falling Sky"? Uderzo's drawings of Asterix and his friends are some of the best, but the story reaches a new low point. 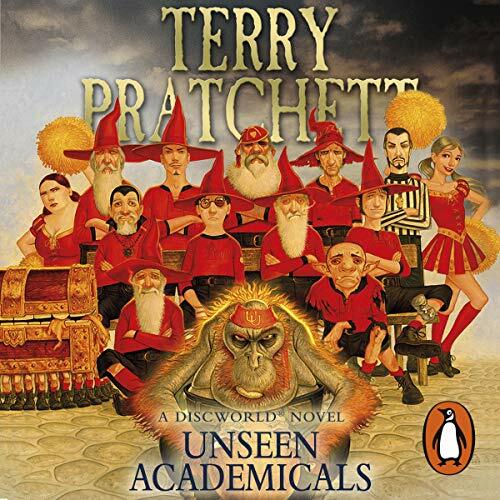 I am not sure if this is really the case with "Unseen Academicals" but it is really not one of Pratchett's best. There are individual episodes of brilliance in the book. You are also left with the feeling that this is supposed to be (partly al least) THE parody on the Harry Potter-series. Yet, it felt if the storyline lacked some of the Pratchett brilliance I have come to know and love. Stephen Briggs, almost like always, does a superb job in the reading of the book. I think he brings the game of foot-the-ball sufficiently to life. If I have to choose between reading the book or listening to his interpretation, I would prefer his interpretative reading by far. Like "Asterix and the Falling Sky" this book is definitely a must for Discworld die-hard fans. 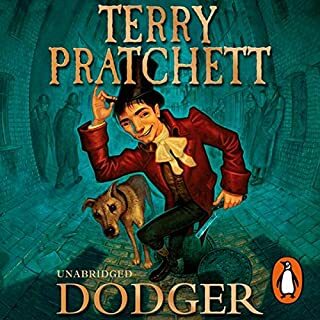 You are also guaranteed a chuckle or two, if you are not so familiar with the Discworld, but I have read and listened to better from Prachett's pen. Maybe, the Unseen University and its staff have become a just too familiar place and set of characters in the Discworld. I am terribly sorry, but not his best work. I love nearly every book Terry Pratchett have written, but I believe that part of the reasen that I don't like it as much as the others is that it is abut fotbal, ore soccer as americans calles it. Nott is a goblin, a rather big goblin, how likes fotbal. He is from a smal place in Ubervald, and Margalotha have taken him in as here word. Vetenari have goten him a job in the university. The story is stil full of wonders, I still love the smaler details, and Normal life and the wonders of magic. Stephen Brigg is a good reader and he is one of the tow people I like reading Discworld stories for me. Would you listen to Unseen Academicals again? Why? I don't typically re-read books, and I have never re-listened to an audiobook. That said it was very much an entertaining listen. Just the way that Terry bends normal life into Ankmorpork life with a twist to make it larger and more important than it appears in our world, but no less important actually. Have you listened to any of Stephen Briggs’s other performances before? How does this one compare? Yes and he does a great job. Could maybe do a bit more with the character's voice, but it does not detract from the entertainment content in my opinion. There are always a few laugh out loud moments with Terry Pratchett, and this was no exception. Keep up the great work. Audiobooks are a great way you get more out of a long and not always interesting drive. Overall this book gets a 5 star rating from me. This is Pratchett up to his usual standard - imaginative, funny, cynical and really enjoyable. 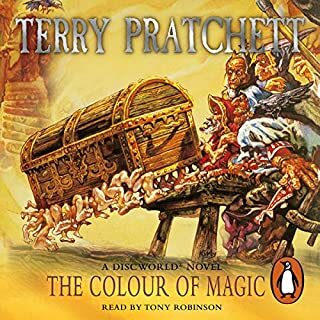 Tony Robinson reads Pratchett really well (although I think I slightly prefer Nigel Planer, who read some of the earlier audiobooks). I listen to my audio books whilst pedalling an exercise bike and using a rowing machine and Unseen Academicals makes a boring-but-good-for-you activity fun. :-) The wizards are learning to play football under the gudiance of one of the university's candle dribblers and we get an insight into the workings of the university's kitchens. Lord Vetinari also features. Unfortunately, no witches, but you can't have everything. Well worth the money. Story: The last Disc World Novel builds mainly on known characters introducing an Orc (Mr. Nutt), Mr Sugarbean, Jewels and Trevor Likely. The story is mainly about the mystery of football and its fans intermingled with the subject of fashion hype, the innovation "micro mail", and rivalry between UU and the Dean's new university. Over all: the novel ranges between the early ones and high lights like the reaper man and offers the known and praised wit of TP together with a fairly arresting story. I had fun listening and can recommend it to the fullest - already waiting for the next disc world novel. I am unable to listen to more than 10 minutes of Unseen academicals due to the fact that to my ears it sounds like Stephen Briggs is just reading a list. 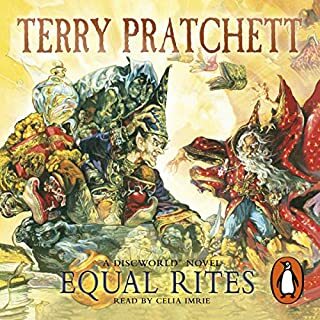 This is my first and possibly last venture into audiobooks as I've been so disappointed by this experience, I've nothing personal against the man, and maybe I just have a very different rhythm of speech in my head than is read out loud, or maybe audiobooks are just not for me? 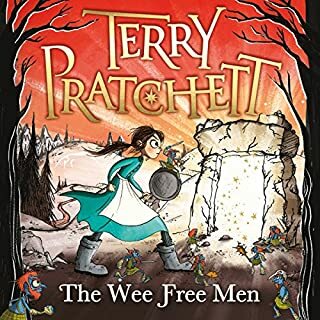 "I can't be doing with fantasy," said my dear 70 year old neighbour, shuddering with well-bred distaste at my suggestion that he'd enjoy Pratchett. But once I had nailed his ear to the MP3 he was soon as full of praise and awe as I am. And saw what is there under the delightful and funny surface. Terry Pratchett just gets better and better. This novel is on a par with Night Watch and Going Postal. I can't praise them enough for their un-po-faced sharing of wisdom and optimism. 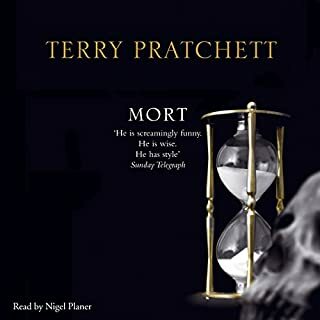 Terry Pratchett is as observant as ever and Briggs narrates the discworld so well that it would be a crime to listen to an abridged version of a discworld novel. Ridcully and the other wizards are so vividly brought to life that the whole book plays across the back of your eyes like a movie.I now have all the Briggs/Pratchett edititions and hope like crazy that more are on the way. Over 'ere son; on me 'ead. Whatever Terry Pratchett chooses to write about he is always able to comment humurously on the way people are. Most of us can identify people like these characters. It is always a joy to read more about Ankh Morpork folk. 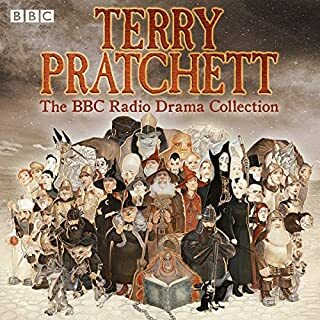 Lord Vetinari, the Librarian, the Watch and CMOT Dibbler, to mention a few, always make me smile and admire Terry Pratchett's creation. This is a brilliant version of a book by the master, and even better that it is read by Stephen Briggs not Tony Robinson as it says on the image. Had me in stitches. The wizards could show Fabio's boys a thing or two on the pitch, that's for sure. The beautiful game is taken to the heights of absurdity by wonderful Mr Pratchett in this brilliantly funny account of Unseen University's version of the World Cup final. I love everything about the Discworld and I loved this book. Buy it, but try not to laugh out loud too much if you listen to it on a train. People give you funny looks and tend to sit far away. I really love Terry Pratchett and feel confident in saying I have read / listened to almost all of his Diskworld books. This is one of my favourites. It focuses around the Unseen University, and the staff of the Unseen University. I enjoy Discworld books and this is one of my favourite a great mix of humour, sport romance and something to make you think.